QUASAR MATERIALS: These materials are for professional development purposes for mathematics teachers and instructional coaches. 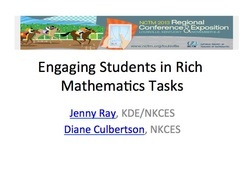 It is an excellent resource for improving a teacher's ability to identify and create rich mathematics tasks. It includes a Facilitator's Guide and PowerPoint Presentation for leading professional developement using the resources listed here. Classroom teacher vignettes are excellent resources for informing teachers AND school administrators about what it looks like to teach and assess using rich tasks, without scaffolding the task such that the richness of the learning opportunity is lost. 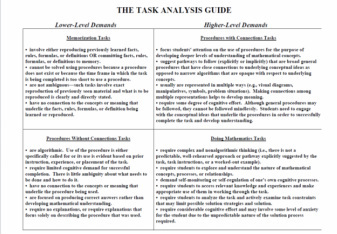 Elementary Task Sorts, Middle School Task Sorts, and High School Task Sorts are provided so that teachers may have critical conversations about what it means to develop and hold integrity of rich mathematical tasks.